Update (8/5/09): Last night, I solved the mystery of this odd bit of construction, when I asked a local builder about it. He tells me that he thinks it's actually a basement for a new home that will erected at that location. 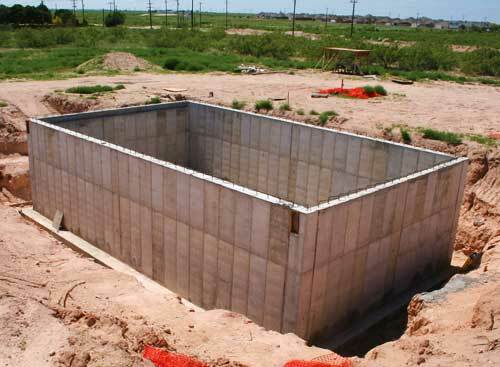 (Unlike in many parts of the country, basements are rather rare in West Texas.) He admitted that it was speculation on his part, but he did know a little about the plans for developing that area. In consideration of the privacy of the potential homeowner, we'll keep his identity a secret. But if it's true, the new house will be an amazing thing to behold. This concrete "bunker" is located near the southeast corner of the intersection of North "A" Street and Mockingbird Lane. It's almost completely hidden from street-level view by the surrounding mesquite pasture. It's hard to get a sense of the size of the structure from this photo, but my guess is that it's about 15' x 30' in area, and about 10'-12 tall. There are no visible entrances and I couldn't see inside the structure to determine what it contains, if anything. I also didn't notice any piping leading in or out of the box. It appears that this "bunker" will be partially buried once completed. Any ideas about the purpose of this mystery construction? Anyone? 'fess-up, Eric ... you and Your Lovely Bride are building your own Panic Room. Yeah, except in this case it would be keeping the rest of the neighborhood safe from us. Once we got in it, I don't think we could get out! Hmmm...the ever elusive crazy deep and rectangular swimming pool of death? Hmm. That could explain the shark fins. It's the new storage facility for the Gitmo retainees! Oh, wait. Are there any air holes? We wouldn't want to torture them or anything. I vote for holding tank---for contaminates, used water, runoff, etc. Maybe a gas station with car wash is coming? Deborah, it does have a vaguely "municipal utilities" look to it, but usually that kind of project has a sign associating it with the city. However, if I had to guess, I'd go with something related to storm water drainage or something similar. Just can't figure out how it works. Oh! I know! They're going to round up all the s-n-a-k-e-s and put them in there and hold an airless cage match between the poisonous and non-poisonous (but just as terrible) until all have departed this mortal coil. Hey, is "s-n-a-k-e-s" really code for "detainees/retainees"? If so, you and Gwynne need to coordinate your responses. The property owner/developer is building his new home at that location. Although panic room, swimming pool of death, retainee/detainee holding facility and snake pit are all possible, my guess would be......wine cellar. It looks like it could be used for isolating from view a lifting mechanism or production facilities for a wellsite. ...a lifting mechanism or production facilities for a wellsite. Well, they are doing some drilling in this vicinity, but all the wells are across "A" Street or Mockingbird, and flow lines would have be routed under those roads. And, again, there's no external evidence of a place to tie in a line. I suppose it could be the world's fanciest mud pit, but I sorta doubt it. Actually, that's not too far from the truth -- or one possible version of the truth -- as I describe in the update to this post. This page contains a single entry by Eric published on August 3, 2009 10:08 AM. Frog and Duck Pictures was the previous entry in this blog. Big Snake Photos Debunked is the next entry in this blog.